This tutorial will teach you how to build a ladder style rocker table for your hollow wood board. The benefit of the ladder style rocker table is that the bottom contour is pressed into the bottom planking. Each rung of the ladder is a specific height and exactly matches the side-to-side contour of the rib it supports. The steps below detail how I built rocker tables for building boards right up until I had CNC capabilities. I have recently switched to using CNC cut rocker tables because as with many board models the ladder starts to take up a lot of space when not in use. If you are ordering the CNC cut framework you can also order the matching CNC cut rocker table and avoid these steps. 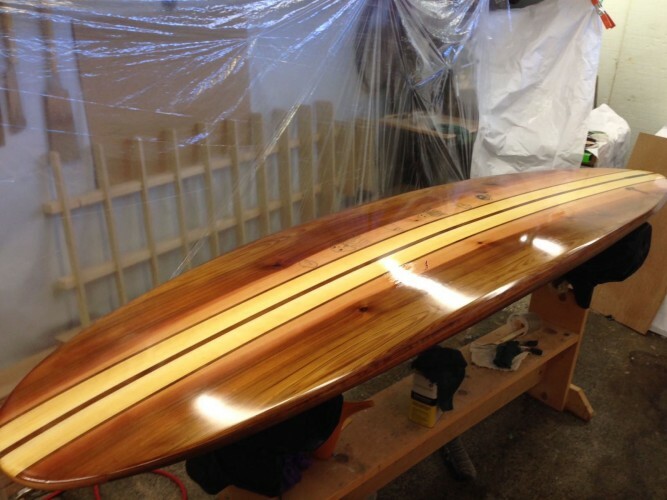 The ladder style rocker table that was used to build this board is leaning against the wall. Here is a close-up of the rocker table being used while clamping the ribs to the bottom skin. The pink rectangle represents the bottom of the board. The plank is sandwiched between the rib above the rocker table almost guaranteeing the desired bottom contour. 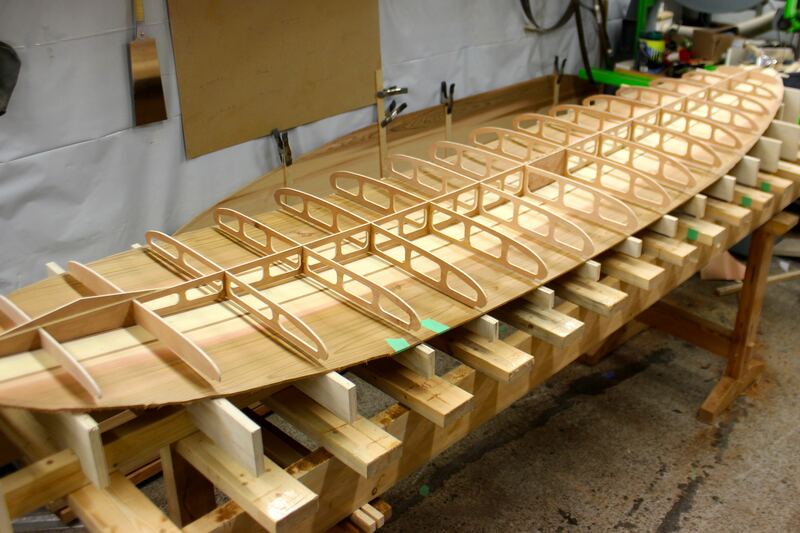 Measure the rocker of your board at each rib notch and record the measurements. Cut enough plywood to make the desired number of rungs. Add 1.5″ to your measurements to allow enough material for fastening the rungs to the rails and scribing the bottom contours. Tip: I usually rip a sheet of plywood for three rungs at a time. One 8′ piece of plywood yields three 31.5″ rungs. Mark the centre line of a block and the spacing for your rungs. 8-10″ works well as you can use narrower rungs as you near the nose and tail. Tip: Use the first board as a template and transfer the line marks with a framing square. 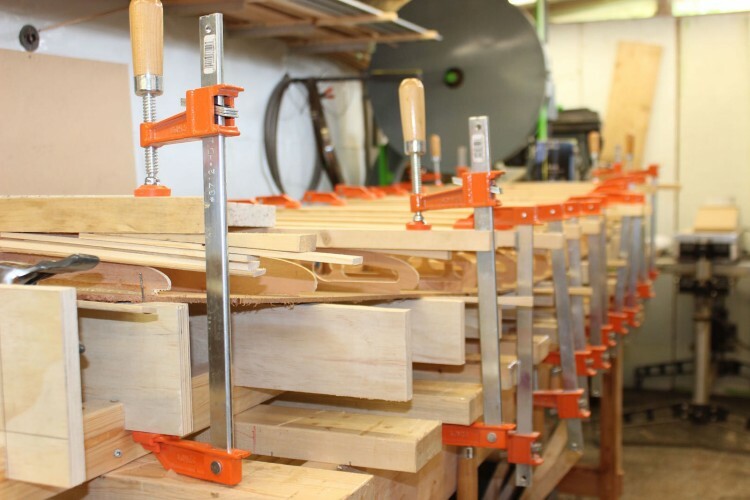 Mark a line at the correct rocker height plus 1″ for the rail you are making. Tip: I add the extra inch to all my measurements in step 1 so that I don’t forget to add it here. Set your rib on line. The centre is the only part that is important as the ribs will transition from a ‘V’ to a concave depending on their location. Level the rib visually and scribe a line with your pencil directly off the rib. Label each rail as you scribe it. Extend the lines to the edge of the board with a ruler. This extra 1/2″ supports the oversize plank. Use a saw to remove the excess material. Repeat steps 1-7 for each rib. Attach the completed rungs to a 2×3 rail by adding blocks or by cutting notches in the rail with a dado blade.